As a byproduct of our work with Tony F. Chan on the total variation model with L1 fidelity, we realized that the piecewise constant Mumford-Shah model can be given a convex formulation. In the papers with Tony F. Chan and Mila Nikolova, we use this observation to give guaranteed algorithms for finding the global minimizer of segmentation models. In subsequent work, joint with Bresson et. al., we showed how to minimize the resulting convex energies using a dual formulation of Chan, Golub, Mulet and Chambolle that was initially used for total variation based energies. 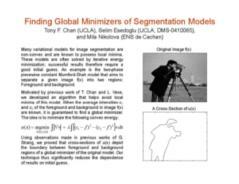 Chan, T. F.; Esedoglu, S.; Nikolova, M. Algorithms for finding global minimizers of denoising and segmentation models. SIAM Journal on Applied Mathematics. 66 (2006), pp. 1632-1648. Chan, T. F.; Esedoglu, S.; Nikolova, M. Finding the global minimum for binary image restoration. Proceedings of the ICIP 2005. Bresson, X.; Esedoglu, S.; Vandergheynst, P.; Thiran, J. P.; Osher, S. Fast global minimization of the active contour/snake model. Journal of Mathematical Imaging and Vision. 28 (2007), pp. 151-167. Kolev, K.; Klodt, M.; Brox, T.; Esedoglu, S.; Cremers, D. Continuous global optimization in multiview 3D reconstruction. Proceedings of EMMCVPR 2007.